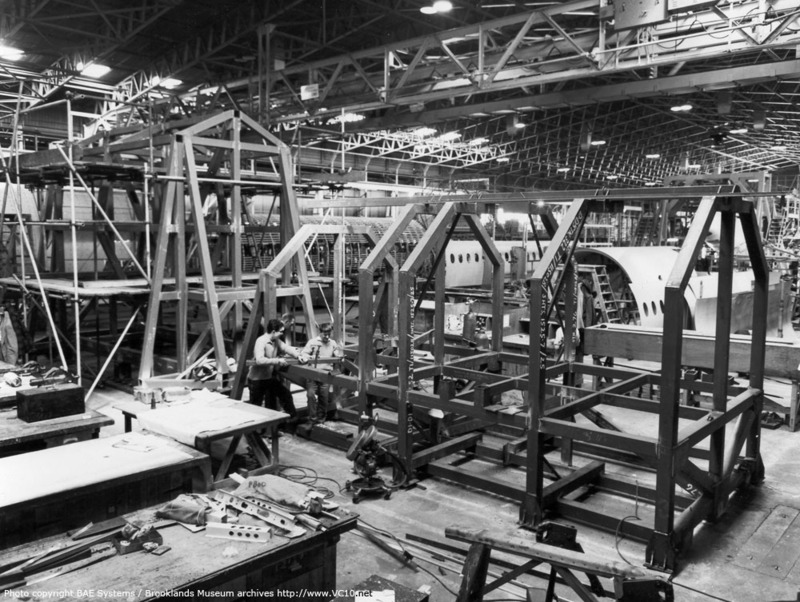 The first realisation of the characteristic rear engined layout of the VC10, now in quantity production at Weybridge. 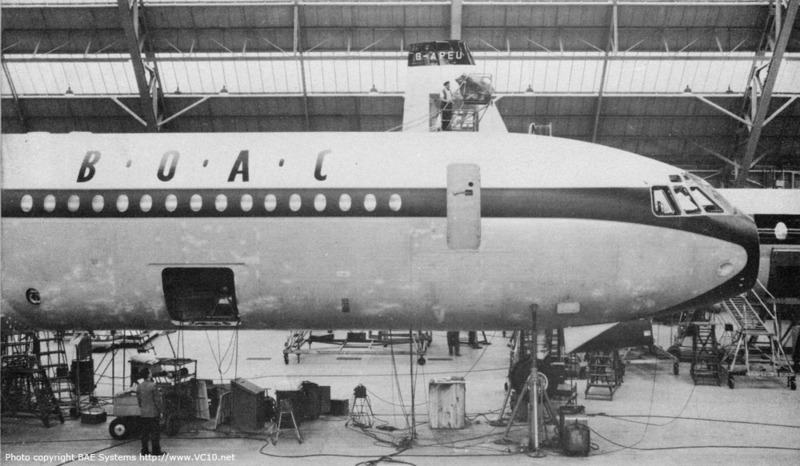 The first VC10 is in final assembly and the first B.O.A.C. VC10 fuselage has left its final assembly jig for systems installation, which is now well underway. Major components are to be seen in the Weybridge, Hurn and Bristol assembly halls for the second, third and fourth B.O.A.C. aircraft. A complete airframe has been constructed for structural test purposes. The forward fuselage is now being prepared for pressure cycle testing in the Weybridge Stratosphere chamber having completed a brief series of tests in the water tank. The main test fuselage is complete and wing torsion boxes are being attached prior to tests in the 'cathedral' frame at Wisley. 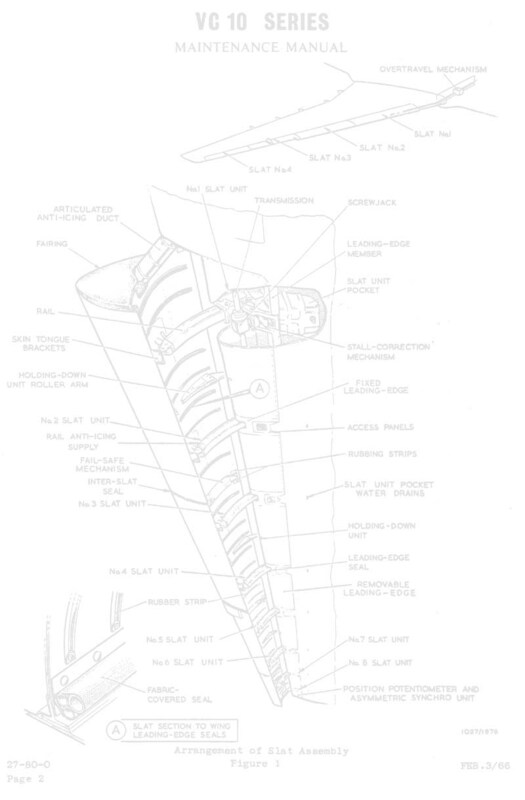 Images of the test fuselage sections are on this page: Test Specimen. 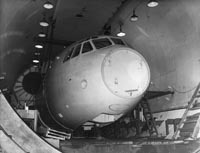 The first VC10 is nearing completion in the Flight Hangar at Weybridge. It is structurally almost complete and engines, systems and flight test equipment are being installed. The main structural stiffness tests are being completed. Ground resonance tests and control surface impedance tests are about to commence. 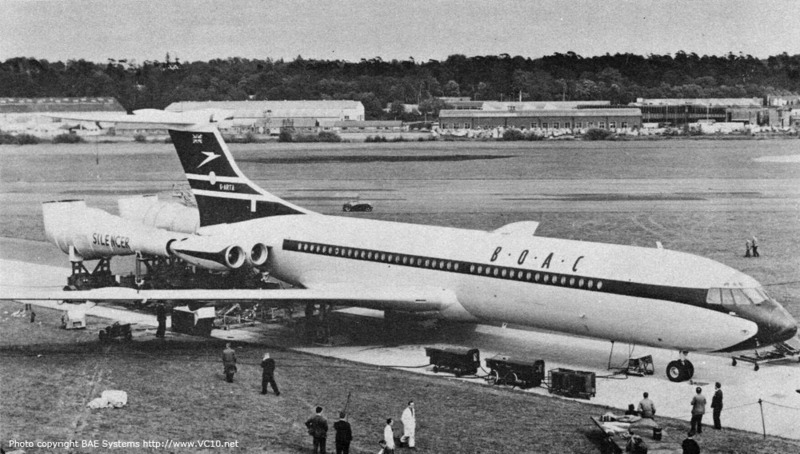 The first BOAC VC10 has wings, nacelles and fin assembled. The second and third aircraft are in final assembly. 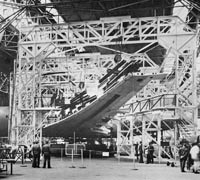 Major components of a further four aircraft are to be seen in the production shops. Super VC10 (13th and subsequent BOAC aircraft) components will shortly be seen on the production line. Mock-up components are complete. All phases of the structural and systems rig test programmes are well advanced. British United Airways hae specified a large side door for freight loading to be incorporated in their basic passenger aircraft. A series of side and nose loading passenger/freight and all freight variants of the VC10 is planned. 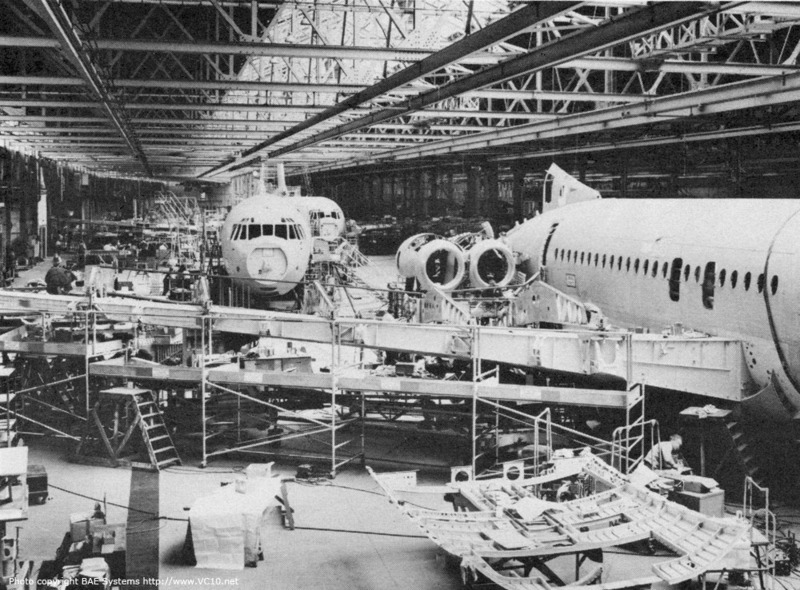 The first (in background) and second BOAC VC10s are on the assembly line at Weybridge. They will shortly be joined by their third aircraft. The fin on the first aircraft already beards the distinctive BOAC blue colour scheme including their well known 'Speedbird' insignia under which the VC10 will introduce rear engined jet travel to the whole of their worldwide network. 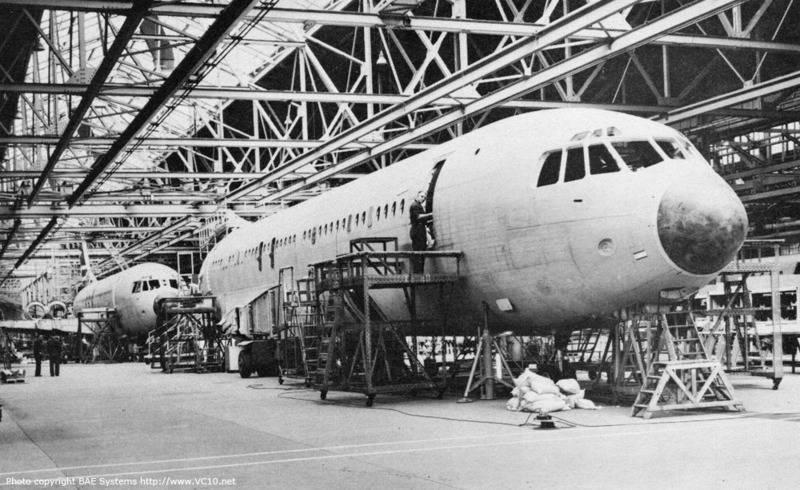 The first VC10 is nearing completion alongside a BEA Vanguard in the Flight Hangar at Weybridge. It is structurally almost complete and engines, systems and flight test equipment are being installed. The main structural stiffness tests are being completed. Ground resonance tests, covering 50 vibration modes, and control surface impedance tests are about to commence. These will be followed by the checking and functioning of the aircraft systems under engine power after 'roll-out'. The intensive flight test programme, including tropical trials and route proving, and involving the three subsequent VC10s off the production line, will be conducted from nearby Wisley. 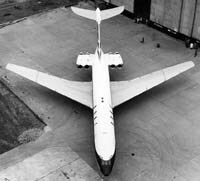 The first BOAC VC10 (registered G-ARVA) has wings, nacelles and fin assembled. The second and third aircraft are in final assembly. Major components of a further four aircraft are now to be seen in the production shops. 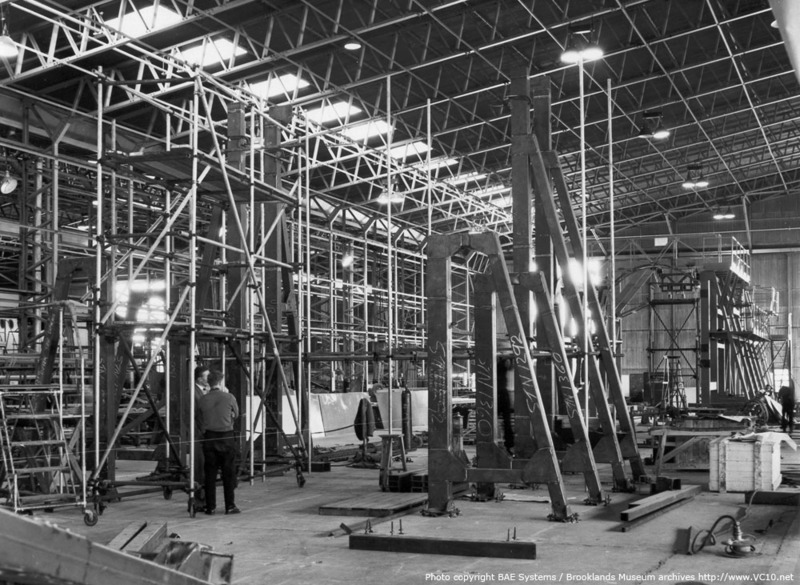 A second Flight Hangar is being built alongside the present one at Weybridge. 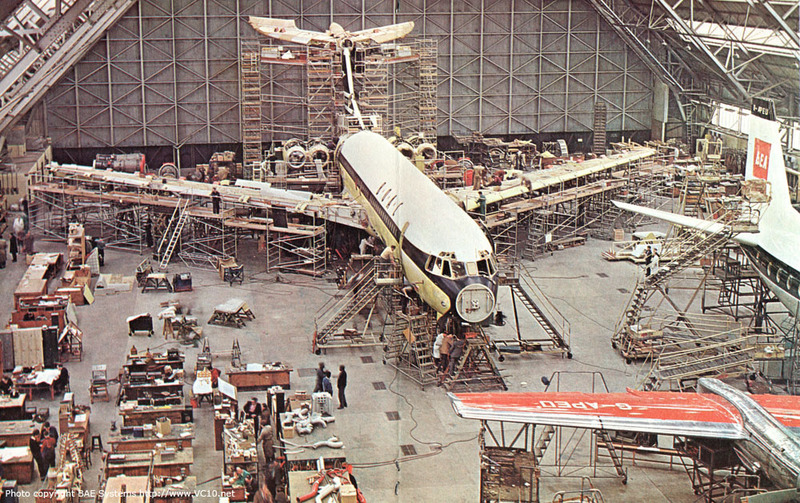 It will be 150 ft. longer and will accomodate four VC10s in final assembly. Component production at Weybridge, Hurn and Bristol is now in full swing. 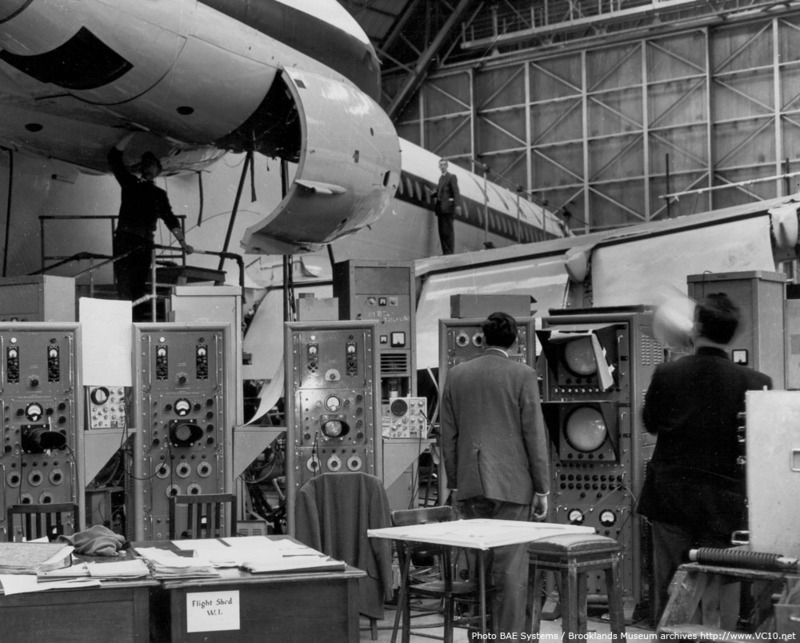 Deliveries to BOAC are scheduled to begin at the end of 1963. 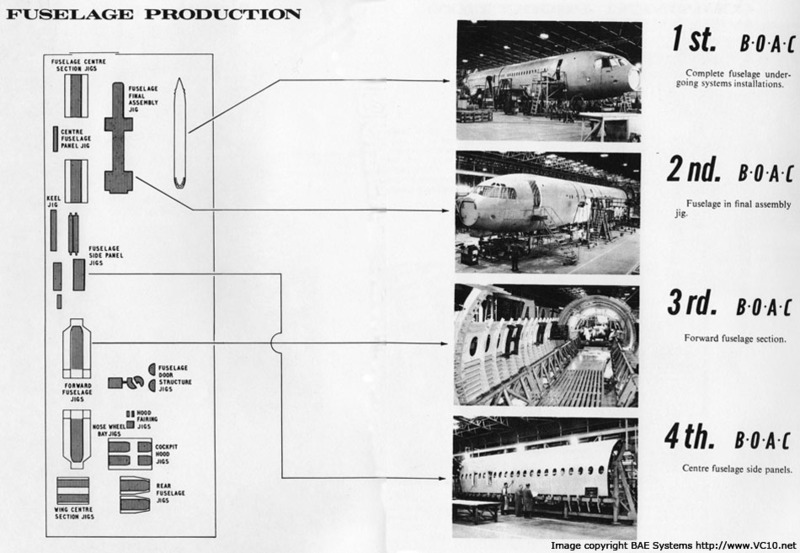 Super VC10 (13th and subsequent BOAC aircraft) components will shortly be seen on the production line with deliveries scheduled to begin in late 1964. 1. The main structural test specimen is now in position in the 'cathedral' test frame at Wisley. 2. 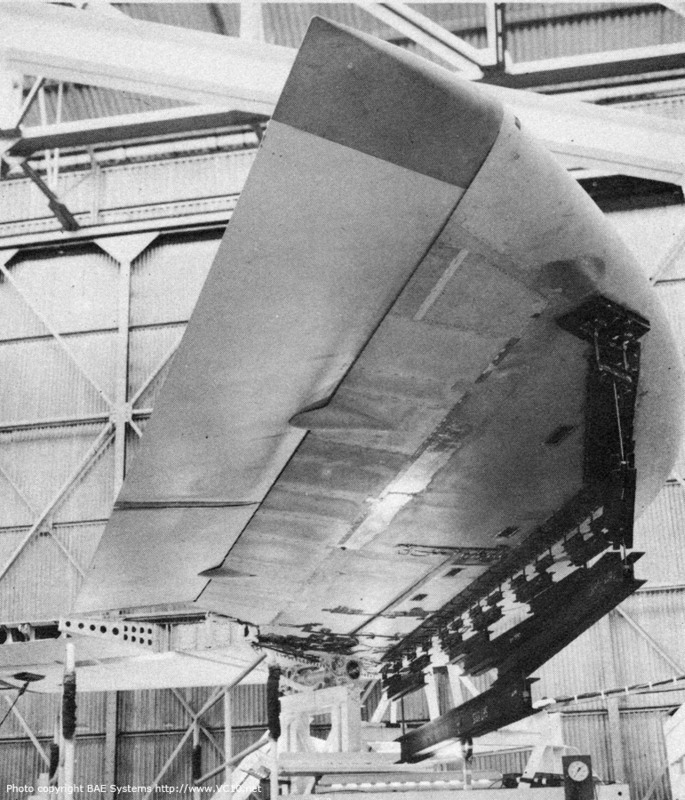 Static load tests on the tailplane. 3. 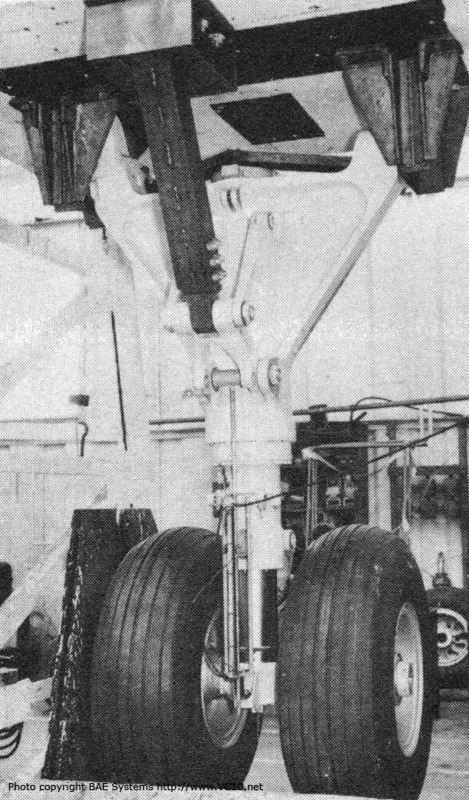 The nose landing gear in the drop test rig. A total of fourteen Rolls-Royce R.Co.42 engines have been built and these have been used for installation trials in the prototype VC10 and for development running. In all over 1100 hours had been run by the end of February. An R.Co.42 Conway was installed in the Rolls-Royce Altitude Testing Facility in December 1961 and carried out over 70 hours running. Its behaviour under simulated aircraft operating conditions was highly satisfactory and the engine achieved its guaranteed performance figures for both power and fuel consumption. 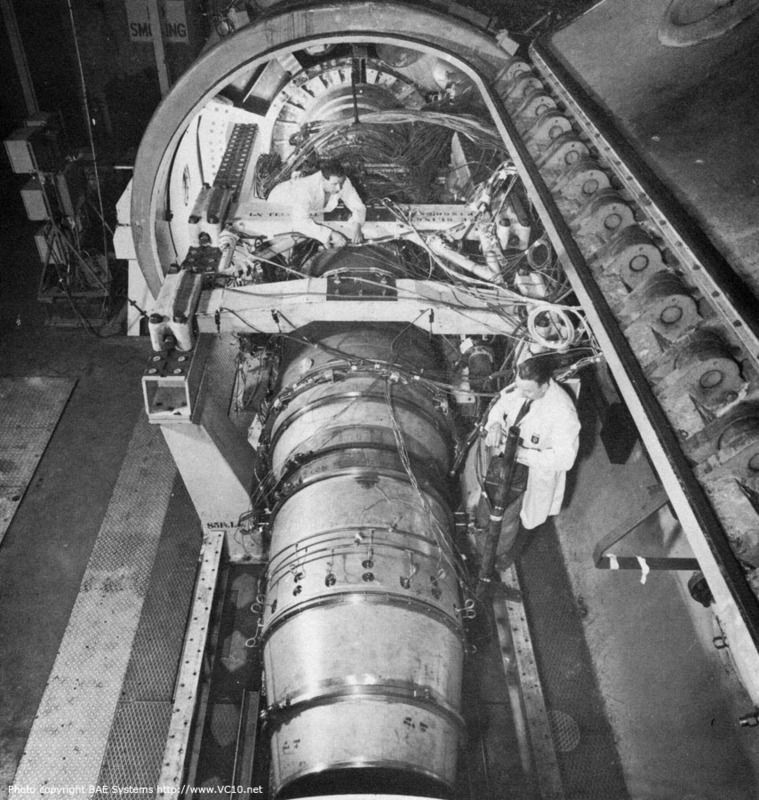 The forward fuselage structural test specimen in the Weybridge stratosphere chamber where altitude, temperature an differential pressure conditions can be widely varied to test such items as the electrically heated flight deck glazing, the door seals and the pressure cabin structure itself. Ground engine runs were started on May 15 following completion of the ground resonance test programme on May 6 and the subsequent proof pressurisation check at 12 p.s.i. on May 13. 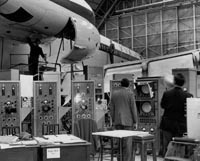 With flight engines installed an initial test cycle, to prove matching of the engines to the aircraft's engine control systems (linkages, interconnection settings, etc. ), was completed in 58 minutes and included four-engine running and rapid acceleration checks. On the following day, May 16, tests were begun on operating the aircraft's systems under fully representative engine power for the first time. 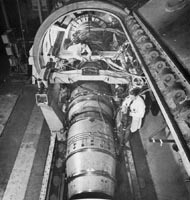 The ground engine running programme was substantially complete by the evening of May 18. The outstanding engine checks cover thrust reverser operation, functioning flaps and slats, and radio interference tests. 1. Ground resonance tests were completed (in 20 days) on Sunday May 6th. 2. Over 45 vibration modes were checked at 150 measuring points all over the aircraft. To clear the VC10 structure for the beginning of flight trials, the airframe test specimen was subjected to a proof loading (66 2/3% of ultimate) on 22nd May. The test was without incident and confirmed design estimates. The picture shows the wing under 60% of ultimate load with a deflection at the tip of 88 inches. Further tests on functioning of slats and flaps while the wing is under load will be undertaken before flight. On completion of a full series of static tests the same test specimen will undergo a fully representative fatigue programme followed by fail-safe tests. The first VC10 (G-ARTA) off the production line was rolled out for the first time on Sunday, April 15th. 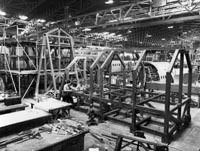 The first three BOAC VC10s (G-ARVA, B, C), which will play a major part in the certification programme, are on the assembly line and fins, nacelles and wings are being fitted. The first aircraft will shortly be moved to the Flight Hangar. The fourth fuselage will shortly join the assembly line. 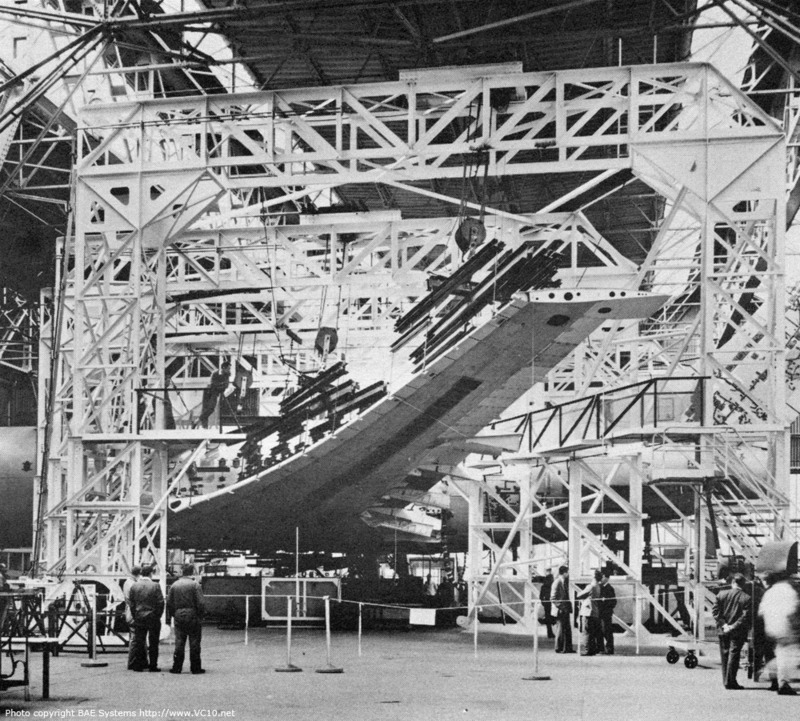 The fifth is in the final assembly jig and major components of the sixth, seventh and eight aircraft are to be seen. Likewise the eight production set of wings is being assembled. Construction of a second flight hangar is proceeding rapidly. 1. Further jigs are now going down at Weybridge to cater for Super VC10 production. Revised doorway jigs will incorporate the 75 inches of extra fuselage length forward of the wing and the 81 inches aft. Super VC10s will have one passenger door forward of the wing and one aft and the rear freight door repositioned to the right hand side of the fuselage. 2. 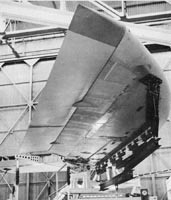 A second fuselage join-up is now being built. 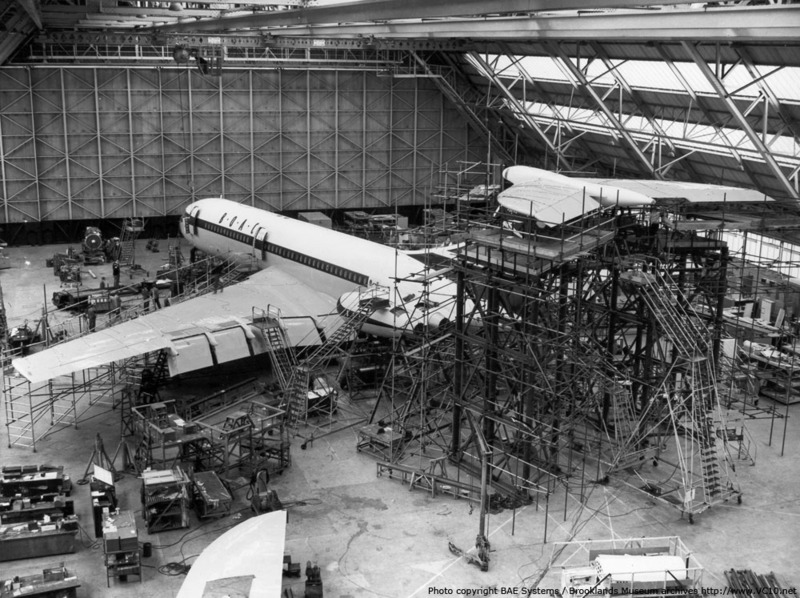 The existing jig, housing the fifth VC10 for BOAC (left background), will be dismantled and modified to take the 13 ft. longer Super. 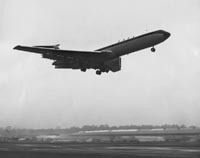 G-ARVA, the first of 42 VC10s ordered by BOAC (12 Standard, 30 Super), made its first flight from British Aircraft Corporation's Factory airfield at Weybridge on 8th November. With an 8 knot tailwind the VC10 was airborne in less than 2,400 feet. Due to low visibility it was flown straight to the Flight Test Centre at Wisley, where it joins G-ARTA, the Company-owned first VC10 which has logged 100 flying hours since 29th June. G-ARVA, fully instrumented, will be used mainly for systems development, within the overall 1,400 hour flight test programme by the first three aircraft.